JACQUES CARTIER explored the northeast part of the continent intending to find the elusive passage to the Orient. Sailing west of Newfoundland he "discovered" the St. Lawrence River and explored the region in three voyages between 1535 and 1541. He met several Iroquoian tribal groups, establishing friendly relationships, though cautious on both sides. He did not find a route to China; indeed the large sea described to him by the Indians"there was never man heard of that found out the end thereof"was probably Lake Ontario. SAMUEL DE CHAMPLAIN was the quintessential explorer. While aptly credited as the founder of Quebec in 1608, he spent little time there, leaving the small fortified post to others and heading further into the Canadian woodlands, where he functioned as the quintessential diplomat. Unlike the Spanish who brutally dominated the Indians for imperial gain, the French negotiated and traded with them, primarily for furs. But it was inevitable that alliances with some Indian groups would make the French foes of others. In this selection, Champlain and nine French soldiers join the Huron in an attack on the Iroquois ("discovering" Lake Champlain in the process). The Iroquois are initially shocked by the French use of firearms, yet within a few years the Iroquois would develop their own cache of modern guns through trade and raids. JACQUES MARQUETTE & LOUIS JOLIET were sent to explore the Mississippi River in 1673 and answer two questions: Was the Mississippi the long-sought water passage to the Pacific Ocean? Were the fabled kingdoms of Quivira and Theguaio real? They are able to answer the first (no), but not the second. They encounter friendly Illinois Indians and unfriendly mosquitoes, describe "monster" fish (catfish) and "wild cattle" (buffalo). Reaching the Arkansas River, they realize they are risking capture by the nearby Spaniards and decide to turn back and return to their post on Lake Michigan. Joliet's journals of the expedition were lost, so we read several selections from Marquette's account. Characterize the French exploration of the interior of North America. What surprised you? What matches your expectations? How do the Europeans define success or failure in the expeditions? What are they looking for? How do the Indians respond to the Europeans? Contrast the first encounters and subsequent contacts. To whom do the chroniclers address their accounts? To what extent are their accounts political "texts"? What changes in knowledge and attitude are apparent in the two maps of Canada created in 1556 and 1664? By the late 1600s, what does the New World appear to offer France? Contrast the French and Spanish expeditions. Are they more alike than different, or vice versa? 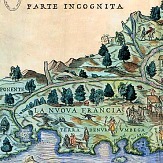 Image: Giacomo Gastaldi, map of New France entitled La Nuova Francia, published in Giovanni Battista Ramusio, Navigationi et Viaggi, Venice, 1565 (1st ed., 1556), detail. Reproduced by permission of Yale University Library. *Karen Ordahl Kupperman, "North America and the Beginnings of European Colonization" (Washington: American Historical Association, 1992), 31.